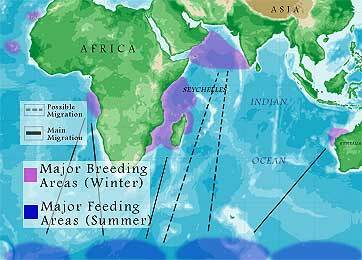 The major breeding and feeding grounds of the Humpback Whales in the Indian Ocean. The dashed line shows the suspected spring and and fall migration routes. The solid lines show mainroutes. This is Genevieve Johnson speaking to you from the Amirantes Bank in the Seychelles. After finding a large group of sperm whales to the northwest of the Seychelles Bank on our last research leg, we are now focusing our efforts on the waters southwest of the island group. For over a week we have been towing our acoustic array through clear, calm waters, however so far the sperm whales have eluded us. These are the species that are the focus of our five-year global expedition. Sperm whales are only one of many species of whales that Roger Payne, the Founder and President of Ocean Alliance has studied throughout his career. Dr. Payne is probably best known for his discovery in 1967, together with Scott McVay, that Humpback whales sing songs. Over the past two and a half years the Odyssey crew has seen and taken tiny tissue samples from hundreds of sperm whales and listened to countless hours of clicks and codas - the echolocation and navigational clicks of these toothed whales. It is hard to believe that we have towed our underwater microphone across more than 37,000 miles of the Pacific and Indian Ocean's without ever hearing the haunting, mournful song of the male humpback whale. Until today that is! Bob Wallace turned off the engine at one o'clock this afternoon when he heard distant, 'eerie' moans on the acoustic array. The crew couldn't believe it. Could this be singing a humpback whale? The elaborate songs of male humpback whales, only the males sing, can be heard most often during the breeding season. Water is an excellent transmitter of sound and the low frequency portions may be heard for hundreds of miles. So what is the purpose of such a remarkable vocal display? It is believed that the males sing in the hope of attracting a receptive female. Perhaps it is also used to announce its presence to other males while also advertising his level of fitness. August through October is their breeding and mating season in the Indian Ocean. These whales migrate to tropical waters in the winter months, returning to the higher latitudes of the Antarctic to feed in spring and summer. Suddenly, the sounds coming through the speakers in the pilothouse became increasingly loud. We knew we were on the right heading. Then the singing abruptly ended and Bob yelled from the pilothouse to alert the crew. By this stage all of us were scattered aloft scanning the seas for a blow. Then we saw it, a single blow and then a fluke. The whale was a mere 500 meters off our starboard bow. Within 1 minute of the animal diving, the singing recommenced. We slowly motored to the area where he had fluked and turned off the engine. The crew was crowded in the pilothouse; the sounds were much louder now. All of us on the boat are all familiar with the famous recordings Roger Payne made of Humpback whalesong in the 1970s, but this was the first time any of us had ever heard a male humpback whale singing, and this whale was singing beneath the hull of the Odyssey. A song can be defined as one or more notes that are repeated in a pattern. Technically, the repeated sounds of birds, frogs and even crickets are songs. Yet, it is the song of the Humpback whale that is the most grand and complex in the animal kingdom. "They are divided into repeating phrases called themes. When the phrase is heard to change (usually after a few minutes), it heralds the start of a new theme. Songs contain from two to nine themes and are strung together without pauses so that a long singing session is an exuberant, uninterrupted river of sound that can flow on for twenty-four hours or longer". Themes are sung in a deliberate order, with the entire song lasting anywhere from a few minutes to half an hour. Humpbacks even employ rhymes in their songs; perhaps this helps them to remember them, a trick which is also used in human composition. 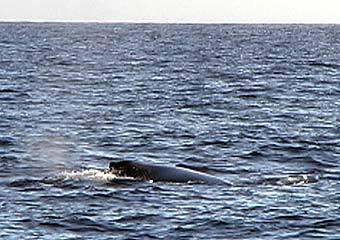 Male humpbacks have been known to sing for hours, even days. We made recordings of each vocalization throughout the afternoon. Each song lasted an average of seventeen to twenty minutes before the animal surfaced. The whale took only three breaths in quick succession before diving again. The distinctive dorsal fin of a Humpback Whale photograped from the bow of the Odyssey. Notice the tiny spray to the left is the blow from the calf. Remarkably, all male humpback whales from the same population sing the same song, while the songs of each population are quite distinct from one another. This means that the structure and content of all of the songs we recorded today are the same, yet different from a whale that may also be singing today in his mating grounds in the Pacific or Atlantic Oceans. As Roger Payne observed "Humpback whales change their songs continually so that after about five years they are singing an entirely new song and apparently do not ever return to the original". While in the midst of an acoustic recording, we spotted another blow almost a kilometre away, and then a breach. There was a second animal in the area but we had no way of determining whether this was another male, or a female. We knew the songs were sung from the animal below us as they matched his dive cycle. When the song ended and the male resurfaced, he had travelled some distance toward the other whale that was now tail breaching as he approached. The male dove again and after almost twenty minutes, resurfaced almost alongside the second animal. As Odyssey approached, the crew saw the two whales come together, the distinctive tall wide blows, side by side. Suddenly Judith Scott spotted a third tiny, barely noticeable blow - a mere puff. It was a calf! By the size of it, it could not have been more than a month old. What incredible luck we are having! We heard trumpeting sounds at the surface as the three whales moved ahead of us on a southerly course. The songs on the array had now fallen silent. Was the mother/calf pair the reason for the elaborate composition of the male? We followed the trio at a distance as the late afternoon sun drew orange patterns on the clouds. As the sun drifted into the sea, we left the whales as they continued on south. The breeding and mating season is drawing to an end for another year. Perhaps these whales were beginning the long migration to their southern feeding grounds, the first for the newborn calf? The crew of the Odyssey wished them well, as we drifted in their wake until their blows faded into the horizon. The crew is once again heading offshore to search for sperm whales in Seychelles waters. The example set by this important Indian Ocean nation, fills us with hope for the sustainable future of the world's oceans and the animals that live there. The people of the Seychelles have much to be proud of. It is they who have demonstrated memorably that one small, dedicated country can make a major difference in the future of all ocean life.